The colors are retired at the close of Thursday’s Indiana State Police memorial service. Closing her eyes, placing her hand gently on her daughter’s head and raising her face toward an overcast sky, Trea Kiefer, 33, prayed along with about 100 other people gathered Thursday to remember fallen Indiana State Police officers. 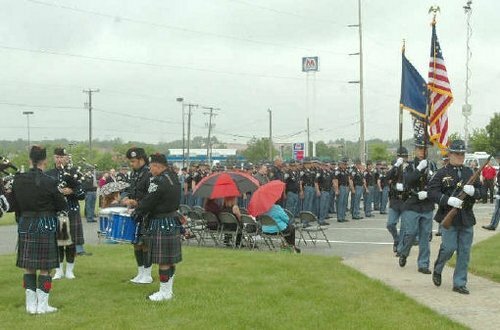 The prayer concluded the annual memorial service at the Indiana State Police Fort Wayne Post, 5811 Ellison Road, during which the names of Indiana’s 44 fallen troopers and a DNA supervisor were read in a solemn roll call. The roll call began with Trooper Eugene Teague, of Indianapolis, who was shot and killed during a gunbattle while pursuing a member of John Dillinger’s gang. The reading ended with Trooper Daniel R. Barrett, of Logansport, who died in a 2008 car crash while pursuing a speeding motorist. Included was Master Trooper David E. Rich, who was shot and killed near Wabash in July 2007 by a motorist Rich thought was stranded and had stopped to help. Rich’s brother, Area 2 Indiana State Police Capt. Bob Rich, read the roll call along with Indiana State Police Lt. Rob Townsend, Fort Wayne Post commander. The greatest tribute that can be paid to those fallen officers is to remember them and their honorable service, Rich said. “They have set the pattern we must follow,” Rich said. After another prayer, taps was sounded, and raindrops fell on the bright duck-shaped umbrella Trea Kiefer held to shield herself and her daughter, Ainsley, 4, from temperamental skies. When the service concluded, Ainsley was soon scooped up by her father, Indiana State Police Senior Trooper Trent Kiefer, 35, a 12 1/2 -year veteran of the force. Trent Kiefer said police officers seek peace by enforcing the law so society can function; he said the memorial service serves as a reminder of the dangers and sometimes the sacrifices involved with the job. “It kind of reaffirms why we’re here for the public,” Trent Kiefer said. Trea Kiefer said she and her daughter attend the memorial service as a way to show Ainsley that her father’s job isn’t easy. Ainsley Kiefer refers to the fallen officers as “Daddy’s friends who have died,” Trea Kiefer said.